Two grape varieties that are traditional to Anjou, the Cabernet Franc is blended with the Grolleau Noir to produce an attractive dry rosé with a pretty rose colouring. The grass growing between all the Grolleau rows has been there for more than 10 years and has maintained a product that can be counted upon : it has limited the higher root growth and has resulted in a markedly lower risk of rotting grapes. This has resulted in a clean vendage, which gives us a clean taste. On the technical side we have introduced for all our rosés a maceration of the skins of the grape to extract extra colour from the fruit prior to pressing. The pneumatic press delicately extracts the "must" and then gravity allows it to fall down into underground vats. At this stage the juices benefit by not using pumps. 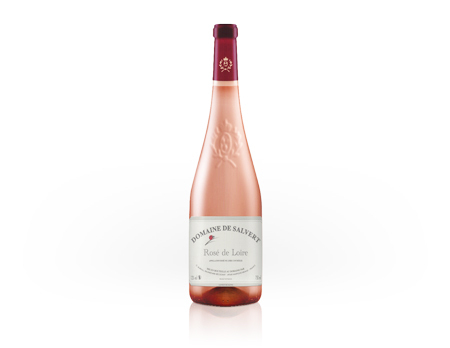 After a single alcoholic fermentation using all the sugar, the rosé obtained is characterised by it freshness and floral expression. The correct temperature for tasting this wine is around 10°C. This wine is an excellent accompaniment for any course with a meal. There is a moment when the wine is at its most seductive : that is when the glass precedes a summer meal! After a few hours of maceration called « pelliculaire » of the Cabernet to extract its beautiful rosy shade the harvest is gently pressed to extract the fruity flavours that characterise this wine. The Vinification process transforms part of the natural sugar into alcohol to about 12% and the sugar residue of about 20 grams gives us this semi-sweet harmony that is so enjoyable. The balance of residual sugar and the acidity makes a joyful freshness in the mouth. The Cabernet d'Anjou has its rightful place on our tables around spicy or exotic foods but it also should be enjoyed as a simple aperitif.